Lara, what was your background before yoga? I started practicing yoga at eighteen, so it is hard to think of a background before it. I skied from a very young age (three years) but otherwise I was not very physical. Though my skiing was pretty good, it’s worth noting that it got remarkably better after starting yoga practice. Growing up I wasn’t a dancer or a gymnast and I wasn’t particularly flexible or coordinated (read: I was awkward). My main interest was acting. I started theatre school at the age of six and was in every play in elementary, middle, and high school. I went to Boston University and earned my Bachelor of Fine Arts in theatre studies, learning acting, writing, and directing. Yoga was a big part of my college life. We had it as part of our acting curriculum and I took classes outside of school too. After graduating I moved to New York City to pursue acting, writing and directing which I did for several years while become more and more dedicated to my yoga practice. How did the practice find you? Yoga was introduced to me as a way to become clear before auditioning or performing. I loved it so much I started searching it out. My first regular class was at a gym across from campus. It was called Power Yoga but I know now it was the Ashtanga Yoga half-primary sequence. I wish I could remember the teacher’s name because she truly influenced me. I can see her so clearly in my mind’s eye. She was very tiny, fit and blond. After that I started looking for yoga classes all over. I didn’t realize that the yoga experience could range so drastically depending on the class. I found that even week to week with the same class and teacher the experiences varied greatly. 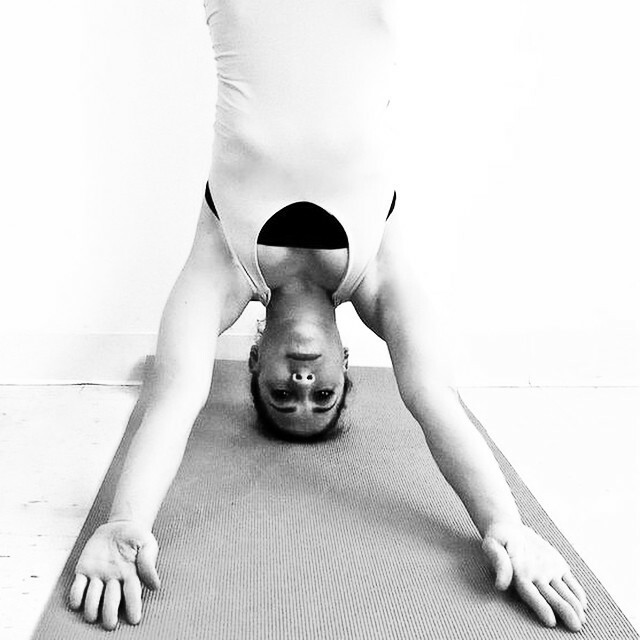 It wasn’t until moving to Brooklyn in 2002 that found another teacher, Andrea Matura doing led Ashtanga classes. I was taking yoga at a place called Greenhouse Holistics and I saw Ashtanga on the schedule. I didn’t know what it was but the time of the class was good for me. The trouble was it was labeled Advanced. When I asked when the beginner Ashtanga class was, I was told it didn’t exist, that you just jump into the advanced and do the best you can. I was scared, but I figured, “What the heck.” It was the most exhilarating experience of my life. After that I only wanted to take Ashtanga. They had five classes on the schedule, a mix of half and full led primaries. I took them all each week. I still had no idea there was anything called Mysore style. I was studying for a while under Andrea Matura. She was a fantastic teacher in many ways, but the most selfless, beautiful thing she did for me was to tell me it was time for me to find a Mysore program. She gave me the names of three teachers based here in New York City and a one-line description of each. The way I remember it is very Goldilocks and the Three Bears: this one is hard, this one is soft, this one is just right. That may have been just my perception, but that is how I recall it. In the end, I chose Christopher Hildebrandt who was teaching at a studio called Yoga Sutra. I remember walking in there the first day at 6 or 6:30am in the morning. Andrea had told me to tell him how long I’d been practicing and that I knew primary series. He grunted. The room was steamy and dense with the breath sound. My heart was beating out of my chest in fear, but I just kept telling myself, “This is for you, not for anyone else. Your practice is for you. It does not matter at all what anyone else thinks.” That was my mantra for the whole first month. After coming daily for about a month and showing my commitment, Christopher started speaking to me more and I felt more accepted into the community. I’m really happy for that experience. It made me so strong and so clear about the purpose of my practice. I always joke with my students that they have no idea how easy they have it. These days you have to coddle more or you’d lose all your students. Back then was one generation closer and it was different. Within a year I was on a plane to India. What exactly captured you about the practice? I really liked the step by step sequencing and the daily repetition of poses. It took so much wondering out of the yoga experience to know going in what I was going to do and then look to the experience to be different. I loved the sweat and the challenge and seeing small improvements in myself daily. I was captivated by the instruction to listen to my breathing and remember my understanding of that instruction taking on deeper and deeper meaning and certain breakthroughs where I would realize what I thought was listening wasn’t it at all. It was through this practice that I began to understand wasted effort and the futility of trying hard but not well. These were major life lessons that I was applying immediately. Lara, can you touch on your first trip to India. What was it like meeting Guruji (or Sharath if this took place after Guruji passed)? My first trip to India was AMAZING! I remember so clearly that Air India flight with my travel backpack and my teacher and and all the chaos. The plane made all these stops not on the original itinerary including a stop in Bangladesh and the passengers were rioting. Welcome to India! We were so late that our driver that was supposed to pick us up had left the airport. That was the old airport too. The restrooms were super small and squat toilets only and I had a time of it maneuvering my bags and skirt and mini tissue packages. The drive from Bangalore to Mysore was crazy of course. I loved all the smells and the little chai stands along the road. I remember that first Indian chai and Christopher buying a little woolen hat to protect from the cooler night air. We arrived right around Guruji’s birthday so lots of old students were there. I spent the first nights at the Green Hotel and I remember meeting Barry Silver and Joseph and just feeling thrown into everything. There was a celebration for Guruji at the shala. He had been sick that winter making his stepping into another year even more special. I was drastically underdressed! My experience in the shala was mainly with Sharath as my teacher but with Guruji as a presence, and Saraswathi keeping the both of them protected and strong. It was a pretty intense time as everyone was trying to keep Guruji from overdoing himself. His will was strong in his desire to teach and adjust. I bonded with Sharath immediately. Every day at the shala I was in total bliss. I would see my arms go up for Surya Namaskar and feel this utter amazement. The energy was so incredible. I seriously felt high. At the end of the month we went to say goodbye and Sharath told me to come back and stay three months. So I had my assignment. Did you experience let down of sorts when you returned home and had to face the reality of self-practice without the energy of the shala or Sharath’s guidance? Actually I was really high after that first trip. I definitely felt like an alien, completely different than others and like I was watching them from a hovering outside perspective, forever changed. I enjoyed practice, but I felt a need to make a life change, and I did. I left my job in health insurance and focused on assisting, subbing, saving for my next trip and starting my journey to yoga teacherhood. Lara, did you make a three months trip to India? When did you start teaching? Yes! The next time I went it was for three months. That was powerful. Towards the end of that trip I found out about an opportunity to teach yoga to genocide survivors in Rwanda from my dear friend Nancy Yu. I went home to the states to raise the money for that trip and set off two months later. I spent three months in Rwanda and went directly from there back to Mysore. Sharath gave me permission to teach yoga to HIV positive children near the shala and I started doing that as well. When I got back from that trip I moved to Harlem. I had been gone for the better part of a year and felt very removed from western society. Slowly I came to know my new neighborhood and got grounded. I took one more trip to India and became authorized before setting out to do what I was always meant to, open Land Yoga. Can you teach a student dedication or devotion? Ah! Great question. You can teach a student what is expected in the yoga room and present loving boundaries that help guide them to the best, most authentic yoga experience, but ultimately you can not force dedication or devotion. That has to come from the heart of the student. You do have a role as a teacher though, an important role. The way you are could discourage or encourage a lifelong practitioner. A great teacher sees each student individually and understands what they need to succeed. A great teacher must also be unafraid of losing a student if that has to happen. What can a student do to fully reap the benefits of their asana practice? The first thing is to feel and not intellectualize the practice, especially early on. It's cliche, but it's so important to just be present and observe without judgment and without expectation, so the practice can do it's thing with your assumptions staying out of the way. Later on there comes a time for study of texts, history, and philosophy. The other thing would be to follow the practice schedule, taking rest on rest days and taking truly significant rest at the end of practice each day. I can't emphasize enough the importance of that stillness after practice. I believe that is when the benefits of the practice sink in. Why do teachers stress the importance of breath in practice? ​Without correct breathing practice can end up doing harm instead of good. This is why I am personally against any sort of video instruction. The eye of the teacher is crucial in the development of the student's steady breath. Too fast a breath and we create anxiety. Lethargic breathing isn't correct either. The breath is our connection between our internal and outer worlds. Through it we come to learn about those connections and understand our expansiveness and our permeability. The breath is the essence of the practice and without it the same movements become hollow and meaningless and are no longer yoga. Focused on it we begin the long journey of coming to know ourselves, the universe that lives inside of us and recognize that it's the same one we live inside. 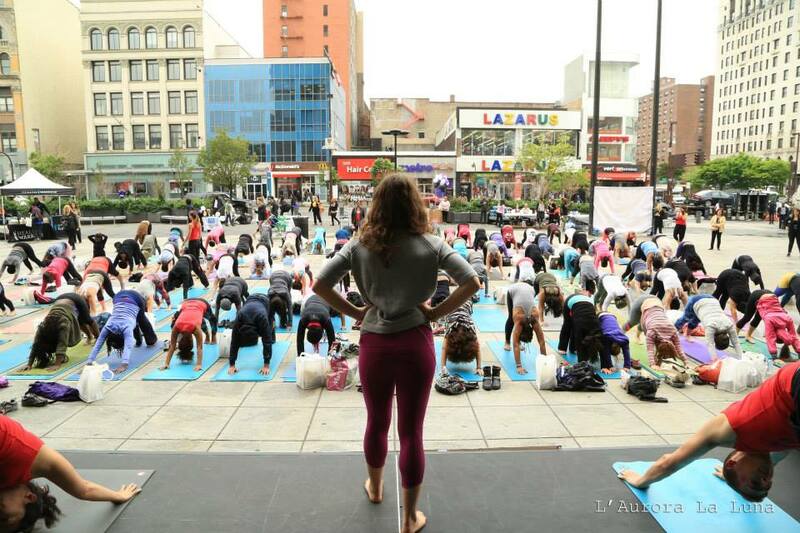 What are the outside yoga projects you're leading the serve the local community? Since opening Land Yoga five years ago I have made it a point to serve our community in every way possible from bringing yoga to the schools, parks, clinics, anywhere possible. Now, we are small and so far I have not figured out how to be in more than one place at once (though I hope that siddhi is coming!) so I’ve had to pare down a bit and get clear on which communities we are going to focus on for the most part. In January 2015, I founded Three and a Half Acres Yoga a non-profit organization empowering communities by using the physical and philosophical facets of the yoga tradition to nurture, heal, and activate residents. We work with communities of color and/or those of moderate income as well as the people who lead or govern those populations recognizing the way yoga can serve as a bridge between people and help us to see the individual. Three and a Half Acres (THAY) currently serves LGBTQ young adults from Harlem United’s H.O.M.E. Center and law enforcement in upper Manhattan. Our cop program is expanding to include the whole city and in the next five years we aim to prove this work works and replicate these partnerships in similar communities nationwide. Each of us is an individual shining light, special and not special. Our only job is to follow our course and do the least harm. For some that is practice and rest. For others it is travel, writing, launching, etc. My only hope and goal is to do what’s meant for me and to create a space where others seeking their light driven, pure missions are allowed and nurtured. I am love and so are you. Doubt lets the darkness in, so be good, be sure and carry on.